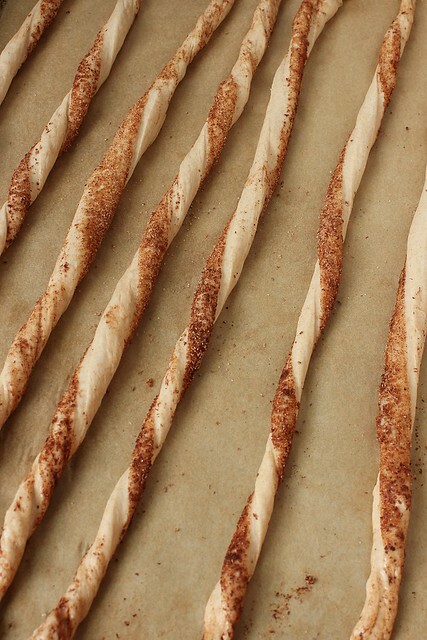 The bake-along challenge for the Sourdough Surprises group this month was twisted breadsticks. 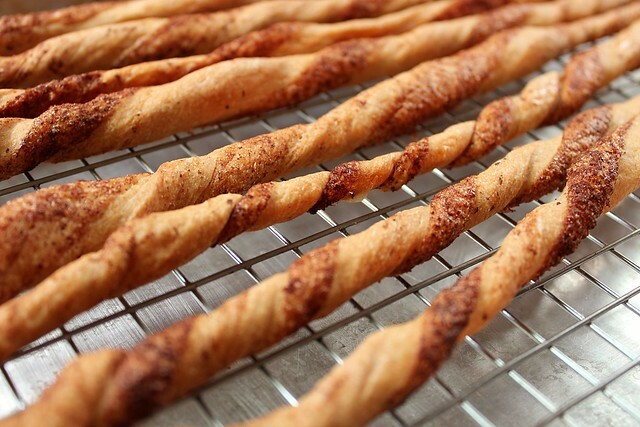 Thin breadsticks, also called grissini, are something I actually make quite frequently - typically out of a portion of pizza dough as a precursor to a pizza dinner night. I had never attempted a twisted variety however, and thought I'd try to sweeten things a bit by using a heavy dusting of cinnamon sugar - and a grating of Callebaut bittersweet chocolate for good measure. The dough was easy to throw together, and quite a quick time frame by comparison of other sourdough projects. The bulk ferment time was only about 2 hours for me, with folds at the 40 and 80 minute marks as recommended. I may have let the dough sit a bit longer, but only because I got busy with other things. I think it helps that my starter has been aggressively vigorous lately. Maybe the Autumnal rains have some part to play in that! I divided the bulk of dough into 3 portions, and carefully formed them into rectangles about 7x4 inches big. I brushed them heavily with melted butter, sprinkled on cinnamon, sugar and then grated bar chocolate across the tops. I may have dotted a bit more butter across the top as well. Each rectangle, I cut into 8 pieces, but next time I would go with 16 since they would be thinner. 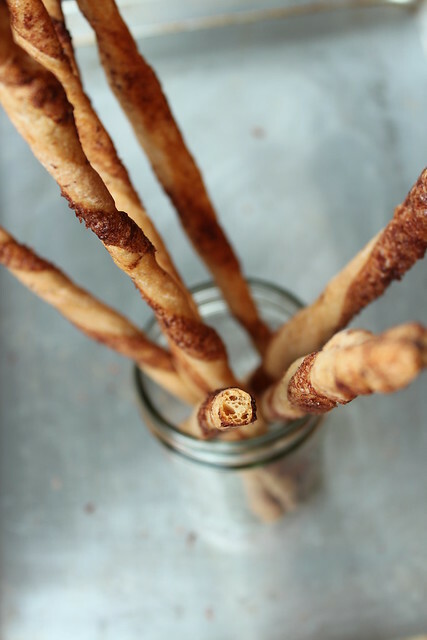 When dealing with grissini, thinner is always better. They bake up completely crisp that way. You may look at the photos and think they aren't that thick, but they do have some oven spring. 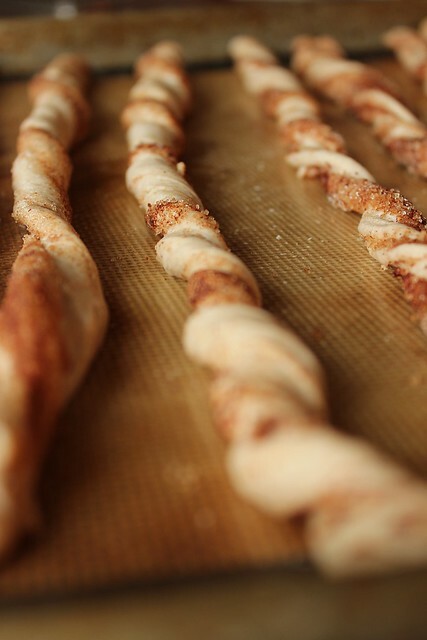 And the undulating nature of the dough creates parts of the breadstick that take longer to bake. I let them bake for about 35 minutes, and then let them cool on the pans. Even then, I still had a few that weren't crisp throughout. That didn't stop us from eating them! The flavor dramatically improved as they became completely cool. When warm, I wondered if I had made a mistake in trying a sweet application. The wheat flavor of the dough seemed like it would have been better paired with olive tapenade as suggested. But when cool and crisp, the cinnamon-chocolate decision was definitely justified. I would make them again, and I will remember to make them thinner and perhaps make half the recipe since the yield was too many for eating in one sitting. Breadsticks are never quite as good the next day. You can find the dough recipe here. And remember that if you enjoy baking with sourdough, you can join the baking group as well! Check out the details on the Sourdough Surprises website.